The vines are predominantly grown in the valley between the villages of Peñalba de San Esteban and Atauta. This wine has been created from grapes from the best quality small plots of less than one hectare, which are located on a steep hill called “Las Comarcas”. 95% Tempranillo (70% from 10-year young vines and 30% from 90-year old vines) and 5% Garnacha old vines (100 years old) grown at an altitude of 950m. Manual picking into 12 kg boxes on October 16th. The grapes are strictly selected both in the vineyard and at the selection table in the cellar. The grapes are de-stemmed and the berries pressed for the alcoholic fermentation in stainless steel tanks and regularly pumped over 2 or 3 times a day. Fermentation was temperature controlled at 25°, followed by 25 days of maceration. 14 months in French oak (2nd year), medium grain and medium toasted followed by 1 year minimum in bottle before being released on the market. 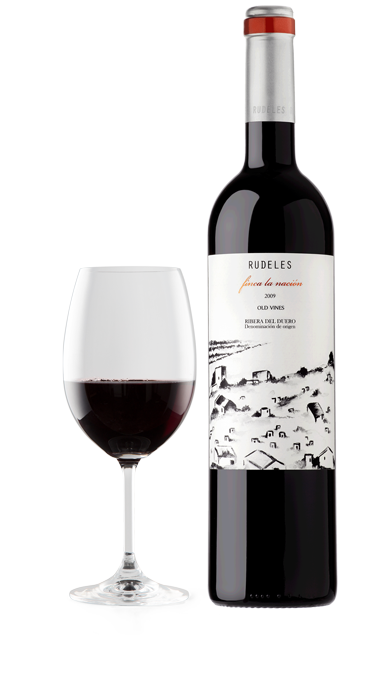 Rudeles Finca la Nación is an elegant award winning wine which displays an intense red cherry colour and garnet tinges. The attack on the palate is firm and rich, with good plum and cherry aromas, and chocolate, pepper and liquorice flavours. The acidity is well balanced and the oak, although noticeable, is nicely integrated displaying an elegant and soft texture with silky tannins. Finca la nación , Ribera del Duero, 2008: The wine presents an intense ruby colour with little rim variation. The nose is packed with ripe blackberry aromas supplemented by a very attractive touch of milk chocolate. It is a powerful and smooth wine that would match to perfection a prime cut of hung beef such as a rib-eye steak.